PitchFuzz is a new multi-effect algorithm that combines fuzz, three pitch shifters and two delays for an amazing range of tonal shapes. It’s the equivalent of 3 high-quality effects pedals in a single stompbox. SpaceTime is a multi-effects algorithm combining Modulation, two Delays, and Reverb into one, easy to use effect. Unique to SpaceTime is the ability to route the Delays and Reverb in series or parallel after modulation. Sculpt is a multi-band distortion algorithm that carves the audio signal into high and low frequency bands and then allows different levels of gain and filtering for each. 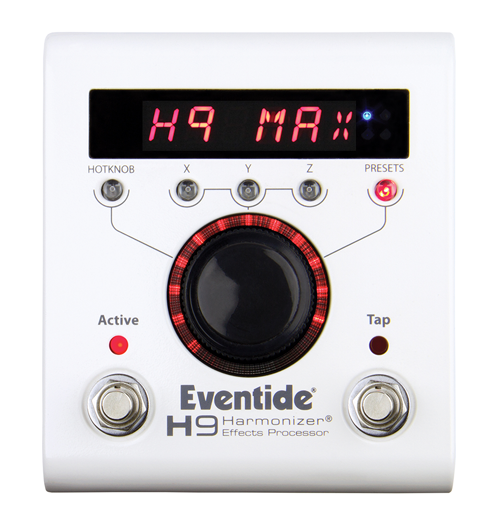 The Eventide H9 Max is a guitarists’ secret weapon. 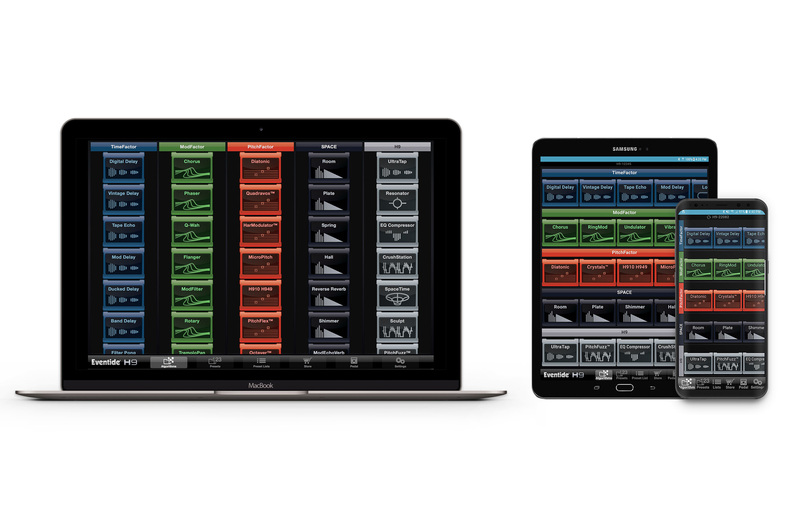 For a session player or hired gun, it means you’ll never have to make do without your desired tones and troubleshoot alternatives on the fly again. I was surprised to see how many of the algorithms actually behave as multi-effect pedals ...the H9 equals one multi-effect, three to four standalone pedals, and a lot of less tap dancing between songs. ...wonderfully integrated effects that replace an entire pedalboard of individual stompboxes. PitchFuzz is a no-brainer for H9 owners, and a great reason to consider getting an H9 for your rig. The reverb, delay, modulation, pitch shifting, and compression sounds are truly studio quality, and especially impressive in stereo....everything else is superb...It didn’t take long for me to see the beauty of the software and the control it offers over the pedal. For both gigging and studio guitarists, the H9 Max might be the only effects pedal you'll ever need. No more hauling around a bag or pedal board of effects and spaghetti mess of cords. Of all the new H9-specific algorithms, this SpaceTime is by far and away my favorite to date. SpaceTime is essentially a little pedalboard of time-based effects crammed into one algorithm. "CrushStation will take you from the depths of molten metal to smooth creamy slightly overdriven tube tones...applications for the H9 Max are unlimited. Being able to ditch my entire pedal board for a single stomp is amazing." Occasionally, a product comes along that can be referred to as ‘game changer’. [The H9] allows you to have almost any effect sound you can think of in the palm of your hand, accessibly easily and with incredible sonic clarity and tone. About the only thing the H9 max can’t do is cook dinner, but that’s okay, as you’ll be having so much fun exploring it effect that you’ll forget to eat. All of the 45 algorithms sound stunning with ‘best in class’ sound quality and a pretty much unlimited range of creative options for sculpting unique sounds. Exploring things like Reverse delay, Pitch Undulator, Resonator, and the cool Looper, I realized there were many algorithms I might never have considered without the opportunity to spend some serious time with them. It is like having the power of Steve Vai, Eddie VanHalen, Jimmy Page and Vernon Reid in the palm of your hand. If Hendrix were alive today, he’d toss his Fuzz Face and Octavia out the window and dive into this hip technology headfirst. Think of it as having Eddie Kramer right on your pedalboard. The Eventide H9 produces glorious sounds that, until recently, required bulky processors costing thousands of dollars...You could twiddle its knobs for years and still find groundbreaking discoveries to take your music to the next dimension. I would just like to say that the H9 Stompbox is amazing product and has been an inspirational tool to my students I've been teaching...it's been requested every session. The upgradeable part of the H9 is a big part of its appeal. But so is the absolutely awesome software functionality, which no other pedal or manufacturer can match these days. 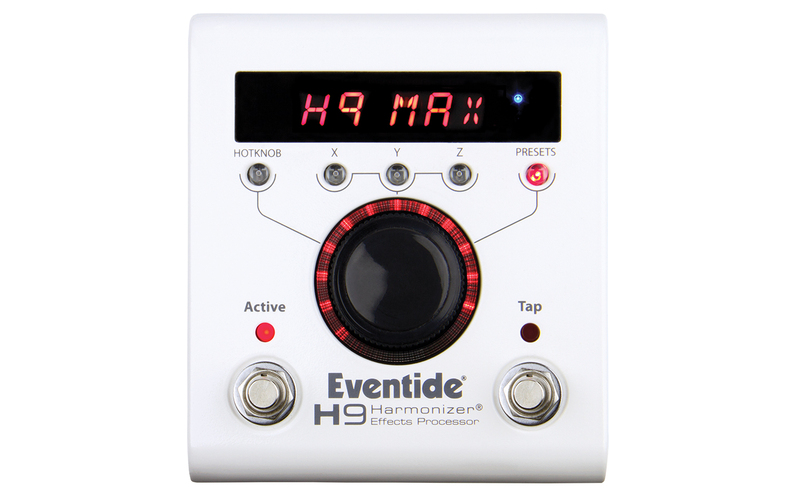 Adrienne Humblet provides instruction on getting up and running with the Eventide H9 Harmonizer stompbox.